Keep an eye out for pollinators on fruit trees. 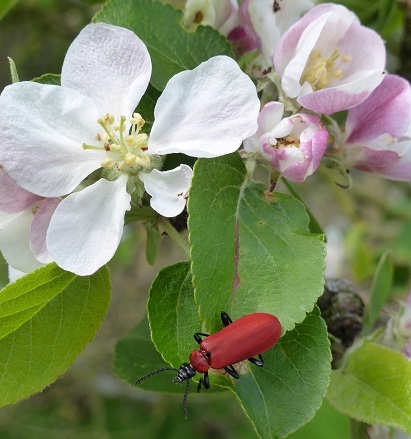 There is a surprising variety of insects to be found at fruit blossom, from the big furry bumblebees to tiny, shiny beetles. The problem with fruit blossom is that it doesn't last long so you need to viisit your local trees a few times as soon as the blossom starts. The insects will need a continuous supply of nectar and pollen to support them through the summer so VLHT manage their grasslands with this in mind. We allow the grass and wildflowers to grow where appropriate to ensure a good food supply for our fruit pollinators as well as all kinds of insects. Below are a few insects found on blossom. Winter can be quite a rewarding time of year to get out in the Vale to look for wildlife. Wintering thrushes including Redwings and Fieldfares enter our orchards in search of fruit; some of the more unusual plants become quite obvious including Mistletoe, a species which grows on old orchard trees and hedgerow shrubs; even a few insects are still on the wing including the very hardy Winter Moth which is still able to fly when there is snow on the ground. As the day lengths shorten and temperatures fall our wildlife prepares for winter. 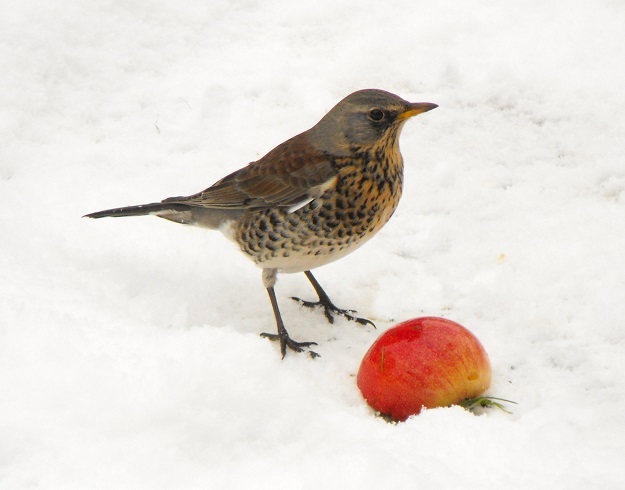 Birds move on, amphibians and hibernate and small mammals stock up food ready. 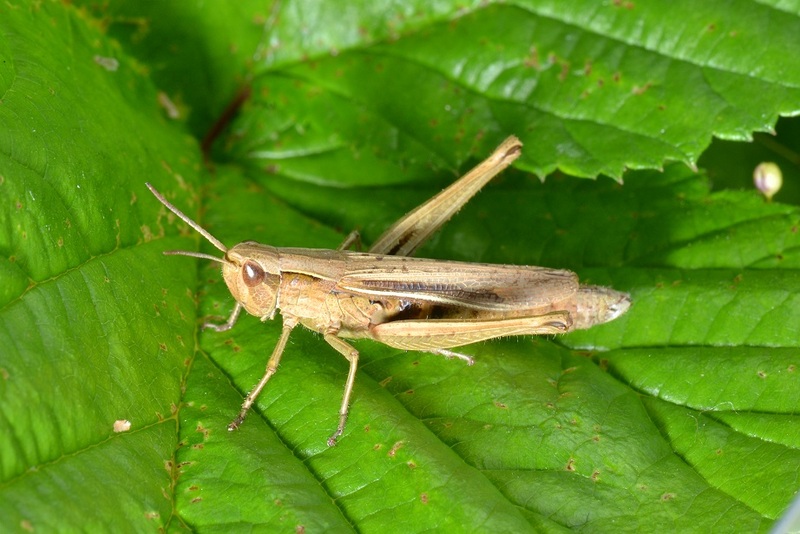 Invertebrates go through changes too; some die off having laid their eggs, some will hibernate but all will be looking for a final boost of energy from food sources. Grasshoppers and bush-crickets can still be found until the frosts come; Orb-web spiders are very obvious as they feed on the ample supply of Craneflies. The climbing plant Old-man's-beard is full of small insects and spiders at this time of year and if you're lucky you might even find a rare Lesne's Earwig (the Avon Valley is a strong hold for this insect). Ivy becomes a very important plant, providing a late nectar source for insects and giving cover to hibernating invertebrates as well as winter homes for amphibians, small mammals and birds. 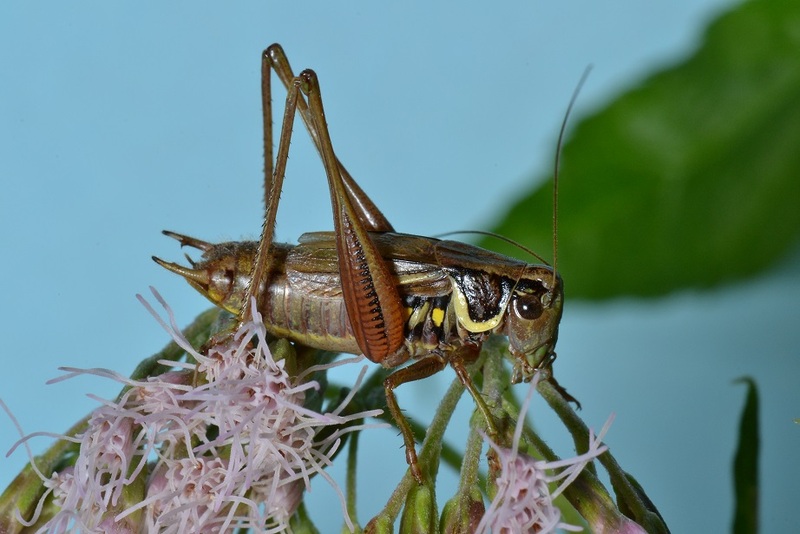 Roesel's Bush-cricket; a recent colonist of the Avon Valley. Lesne's Earwig; a rare insect with a strong-hold around the Avon Valley and south Worcestershire. Ivy flowers provide an important late nectar source. Butterflies including the Red Admiral get their final feed of the year form Ivy before moving south or hibernating. 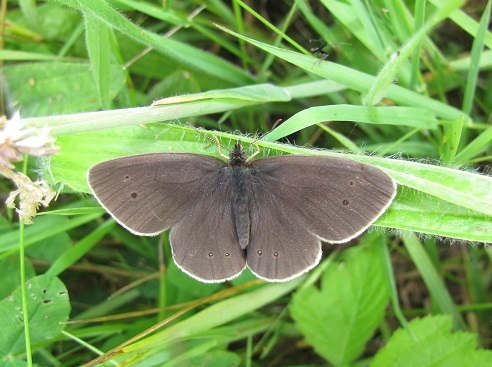 There are lots of butterflies and day flying moths to look for, especially in grasslands. However, mid-Summer is an odd time as the butterflies are brown and the moths are colourful. 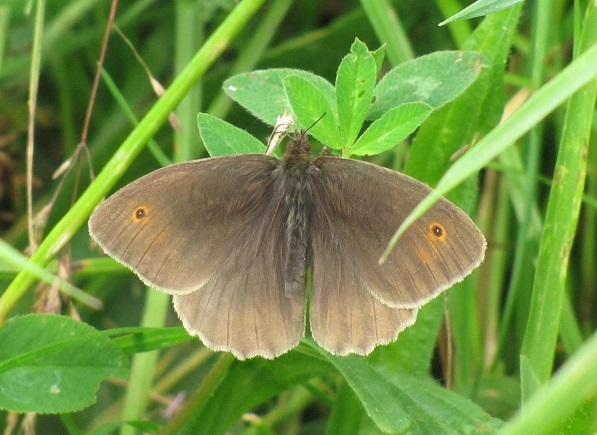 Meadow Browns and Ringlets are very common at most grassland sites for a few weeks during the summer from the end of June to August; Meadow Browns have patches of orange on their brown wings and Ringlets have dark brown wings with several 'eyes' on the underside. These are joined by the much rarer Small Heath in small numbers at some sites and the speciality of the Vale, the Marbled White can be very numerous on roadside grassy banks as well as good grassland sites. The most obvious moths are the burnets. These slow flying red and black moths are a common site on thistle flowers at this time of year. The Cinnabar is a very similar looking moth but is not such a common site. Its caterpillars feed on ragwort and they take in toxins from the plant which make the caterpillar and moth poisonous. To warn would-be predators, the caterpillars are yellow and black and the moth is bright red and black (nature's warning colours). In mid-Summer the butterflies are brown and the moths are colourful. Top centre - Marbled White. Top right - Meadow Brown. 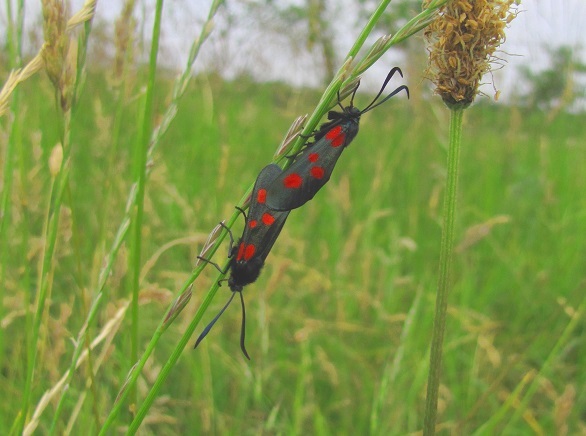 Right - Burnet moths mating. At a recent volunteer work party at Hipton Hill we were attracting the attention of a few horseflies. It is only the females that bite, as they need a blood-feast to help produce their eggs. I explained that horseflies are worth looking at a little more closely as they have the most beautiful eyes, very colourful and each species have their own distinct pattern. The volunteers humoured me well but I don't think they were convinced so I caught two species at Hipton on 18th June 2014 and the photos below show just how attractive these flies actually are. 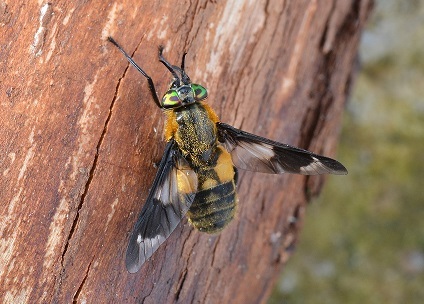 Next time a horsefly lands on you, stop and take a moment to look at its eyes before reducing her to a grey and red smear on your arm. This is the time for songbirds and some of our most beautiful wildflowers. In our orchards the blossom has finished and the fruit is setting but the grassland beneath the fruit trees is coming alive with the blooms of orchids. Four species flower in our orchards; Common Spotted, Bee, Greater Butterfly and Pyramidal. See our EVENTS page for details of walks where we will be looking at the birds, bugs and wildflowers found in some of our reserves. Most of our sites have limited or no public access so our walks are a great opportunity to see some undisturbed areas of the Vale. Burnet Companion; Appears just before the colouful red and black Burnet Moths. 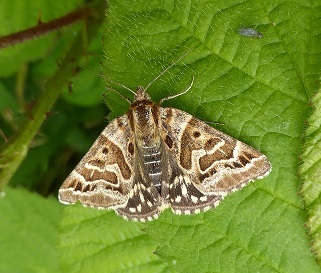 Mother Shipton Moth; Can you see the face of a witch on each wing? 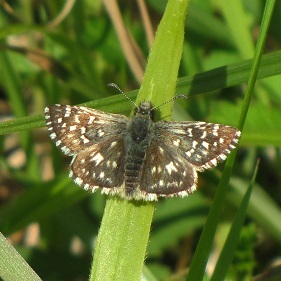 Grizzled Skippper; A rare moth-like butterfly that feeds on Wild Strawberry plants. Some of our sites are good places for dragonflies and we are working to restore some of our old farm ponds for this reason. It's not just the wetlands taht are important for these aerial predators as they fly long distances to find places where they can feed on other flying insects. 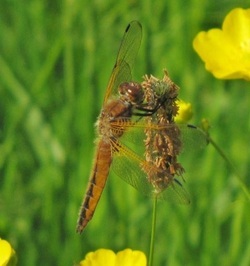 S our meadows and orchards offer ideal feeding places for some dragonflies. A very early Scarce Chaser Dragonfly was seen at Great Gore meadow on 16th May 2014. This is two weeks earlier than any other year in Worcestershire. This dragonfly breeds in the river Avon and then adults head away from the river to areas where they can feed on other insects. They then return to the river to breed. Other dragonflies seen at our sites include Emperor, Southern and Migrant Hawkers, Black-tailed Skimmer and also White-legged and Large Red Damselflies. Our reserve at Lower Moor is well known as an important site for migrating wading birds and a report is given in our quarterly newsletters. Many species use the site to rest up as they pass through on migration including Dunlin, Little Ringed Plover, Curlew, Redshank and Avocet (the latter two species are pictured below - note these images are not the actual birds from Lower Moor but are included to illustrate the species). Our sites in the Littletons are important for farmland birds, especially in winter. Leaving some weedy patches near arable land means there is winter seed for Yellowhammers, Reed Buntings, Skylarks and Corn Buntings. Also during times of high rain-fall some of our sites become important stop overs for Kingfishers and Grey Wagtails that struggle to feed in the larger flooded rivers. Redshank: we are managing Lower Moor to create suitable breeding habitat for this and other species of wading birds. 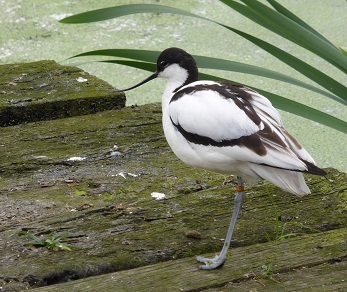 Avocet: a bird which now breeds in Worcestershire. Lower Moor provides an important resting and feeding area for these and other migrating species.